Survival: God Bless the Cockroach! I recently gave a presentation about client retention to an audience of experienced business coaches. The presentation highlighted why coached clients stay or leave a business and executive coaching relationship. What you told me to do didn’t work, etc. Clients stay in a coaching relationship as long as they feel they are getting value. It truly is that simple. As long as clients feel that they are receiving value for their time and money, they will continue. Of course, there are many textbooks on value creation. And every client is different, really different. One may want to grow sales. Another wants to improve profitability. They may want to develop a succession plan or they may just want to work fewer hours. So what is the key — the key to survival? 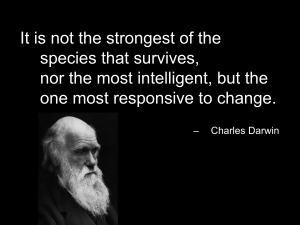 I use a quote from Darwin about survival that seems to illustrate best what it takes to retain clients. A good friend and business coach, Zev Asch, was inspired by this concept and expanded on it in “The Cockroach and the Successful Business Owner.” It is a good read, reflecting on the keys to successful business lead.